Made up of military-issue surplus tools, our Everyday Carry kit provides a few essentials that'll always be close at hand. The tiny, USA-made tool set is built to government specs, and includes a small steel pry bar (good for a variety of uses), black oxide steel tweezers (splinters and ticks, be gone), a micro grappling hook (don't ask), a pair of small screwkeys (one phillips, one flathead), and a capsule lighter (maybe the world's smallest). It's all strung up on a stainless steel aviation cable that's carried with a custom machined belt loop clip. Just add keys. Uncrate is the leading buyer's guide for men. With over 9,000 items covered and more than 1.5 million monthly readers, Uncrate is widely known for digging up the best of the best men's products. With new gear posted every weekday, Uncrate has quickly become one of the largest men's publications, both online and in print, with over 10 million page views each month. Since 2005, Uncrate's dedicated readers have visited multiple times per day to find out about the latest stuff for guys. 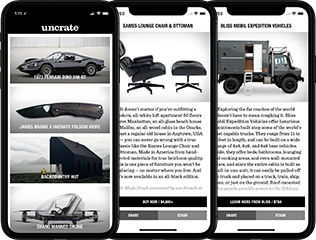 Uncrate's insightful and daily updates, with near real-time coverage of new product launches, has gained the site an audience of discerning men who turn to Uncrate for the next great thing.